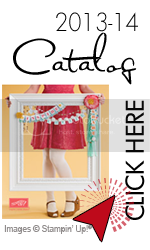 I hope all of you have had an opportunity to look through the new Occasion Mini catalog I sent you. There are several stamp sets that are perfect for the warmer weather that will be here for everyone very soon. The set that immediately caught my eye was the Tart & Tangy set, http://catalogs.shoplocal.com/stampinup/index.aspx?pagename=shopmain&fsid=0cf2585c-0aee-4e71-9de1-c45a2f6fe1c1&storeid=1038724ˆularid=12510. This cut 4 piece stamp set is perfect for summer party invitations. You could make an entire theme uses the stamps and the coordinating paper found in the mini,http://catalogs.shoplocal.com/stampinup/index.aspx?pagename=moreinfoˆularid=12510&pagenumber=16&uniqueid=13590948&storeid=1038724. 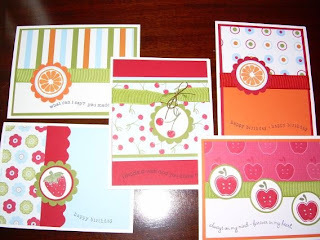 The above picture of the 5 featured cards along with a matching box will be my next at home class Sunday, April 27th. The set would make a wonderful Mothers' Day gift for someone near and dear to you. With that in mind, I will have many sentiments available for you to choose from.